"Hy-Tech" Cardan shaft is a mechanical component for transmitting torque and rotation, usually used to connect other components of a drive train that cannot be connected directly because of distance or the need to allow for relative movement between them. We manufacture a wide range of Cardan Shaft used as a mechanical power transmission element in heavy industries. We hold an expertise in providing best quality Cardan Shaft to our reliable customers. This Cardan Shaft is available in numerous designs that are flexible in nature. Further, our Cardan Shaft is effective to use due to its quality assured nature and less maintenance requirements. Offering a wide range of dry shafts, which are known for their precision design. 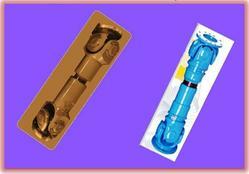 These are used in automotive industries that helps to eliminate bump steer on lifted vehicles. These are available in various sizes & standards at fair price range for bulk buyers. Our cardan shaft and other products working are based on drawing, Technical drawing of every products are made before starting the manufacturing process. Every size and tolerance mentioned in the products drawings. Our Propeller shafts or Cardan Shafts offers a mechanical component for transmitting torque and rotation, which is used to connect other components of a drive train that cannot be connected directly because of distance or the need to allow for relative movement between them.